iScale @3x for Mac Released! 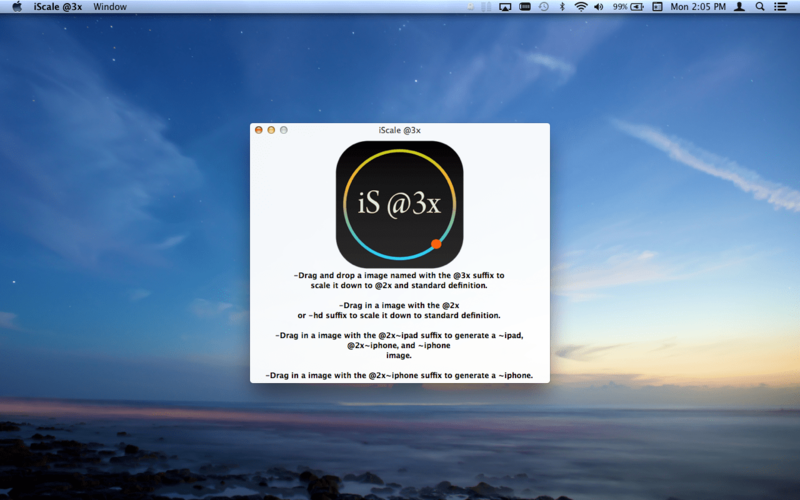 Easily scale your @3x images down to @2x and standard definition for your iOS and Mac apps! Just drag and drop your @3x named images onto the window and let iScale @3x do the scaling for you! -Automatically generates an @2x and a standard definition image from an @3x image. You don’t have to manually resize the images in an image editor anymore! -Still supports generating standard definition images from @2x or -hd named images! -Supports the @2x~ipad suffix! Drag in an image with the @2x~ipad suffix to generate ~ipad, @2x~iphone, and ~iphone suffix images! -Supports the @2x~iphone suffix! Drag in an image with the @2x~iphone suffix to generate an ~iphone image! -Supported image types include: .png, .bmp, .jpg, and .tiff! So what are you waiting for? It’s time to do more faster! Get iScale @3x now! Laugh Clown Professional Balloon Dodger Official Game Trailer!